Drum Mixers – WAM Inc. Drum mixers are generally used to blend mixtures of low to medium viscosities such as cement or adhesive slurries; this particular kind of mixer is capable of mixing substances of very different particle sizes such as gravel and cement slurry or ice cream and fruit. Internal paddles or blades mix, blend or clean and a sturdy frame supports the drum as it rotates or tumbles. These are inherently batch mixers because they work with a single batch at a time. 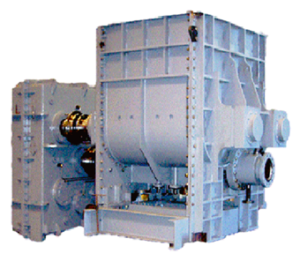 Drum mixers are made from steel and can either have thick walls or thin walls depending on capacity and insulation properties needed for the process. The mixers are powered by pneumatic or electric motors. Sizes for drum mixers include 5 gallon drums, 55 gallon drums and mixers for tanks that can hold up to 950 gallons. Many industries utilize drum mixers including the food and beverage processing, pharmaceutical, construction, manufacturing, cosmetics and agriculture industries. Drum mixers are frequently used to mix disparate dry and wet materials, chemicals, plastics, cement, biodiesel and many other products. Drum Mixers – Reynolds Industries, Inc. Drum mixers are available in a variety of configurations to suit many different needs and applications. One kind of drum mixer uses a paddle with numerous blades curving in different directions; this is called a swing-blade paddle. 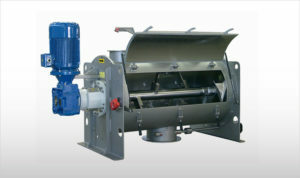 The swing-blade design allows the drum mixer to maximize liquid movement within the rotating drum, which cuts down on time spent mixing the product. Swing-blade paddles are made from stainless steel or zinc plated steel and can be portable and sold as a single part, or as part of the drum. The swing-blade can be moved to point upwards or downwards to maximize liquid movement at all RPMs (rotations per minute) and can be adjusted for various containers and mixing patterns. Other kinds of mixing blades or paddles include a scraper blade which cleans the system, a shaftless blade that is used with an open head frame, a shear knife paddle for cutting and a manifold paddle for steam or liquids. Depending on the capacity of the drum, paddles can fit onto container lids and may easily be moved from one drum to another. In the case of larger drums, the paddles are attached to stainless steel poles; the pole is then attached to the lip of the drum using a clamp, or screwed into the lid of the drum. Drum Mixers Drum mixers are gallon drums that rotate in order to mix chemicals and materials such as gravel and cement. Drum mixers are a broad category of mixers with many variations. For example, portable drum mixers are one type of drum mixer which may be used for in-container mixing. Other drum mixers have their own container into which materials must be poured.